But let's talk about videogames. Let's talk about Peach. Princess Peach is one of the most iconic princesses in gaming; she's also one of the least interesting. Like Sleeping Beauty, Peach's only purpose in the story is to provide the hero with an objective. We are told almost nothing about her personality or her relationship with Mario, nor are we given an explanation for her kidnap. In Super Mario 64, Peach appears for two sentences' worth of exposition and is not seen again until the end of the game. In fact, up until her rescue, there's no solid evidence she was kidnapped in the first place. For all we know it could be some tremendous hoax and Peach might pop up at any second with a bottle of champagne and a birthday card. Next to Peach, Zelda's easily the most recognizable princess in gaming. Zelda makes for a slightly different princess in that she is intrinsically related to the plot, but rarely takes any action to further it. In most of the Zelda titles, Princess Zelda acts as Link's guide (along with that fairy, the Deku Tree, that other fairy, and that thrice-damned owl), supplying him with pivotal information before sending him into a fish monster's intestinal tract. Zelda's abduction typically occurs at a critical point in the narrative, which heightens our sense of urgency about the situation. Still, it's not always enough. We're presented with a set of perfectly good reasons why we need Zelda back, but we don't actually miss her. As the player, nothing is lost to us through Zelda's disappearance. Contrast this with the point in Twilight Princess where Midna is seriously injured - the thought of losing your constant companion evokes a much greater emotional response than the predictable incarceration of the princess. 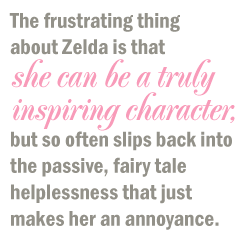 The frustrating thing about Zelda is that she can be a truly inspiring character, but so often slips back into the passive, fairy tale helplessness that just makes her an annoyance. In The Wind Waker, she went from a mischievous, hot-tempered commander to a querulous, apologetic princess - losing all of her charm and likeability, and instead becoming weak and uninteresting. Both Wind Waker and Twilight Princess attempt to combat this characteristic weakness by having Zelda take up a bow during the final confrontation with Ganondorf, but this last-ditch attempt to strengthen Zelda's character fails spectacularly because she couldn't hit the Gerudo King if he were the size of Jupiter.